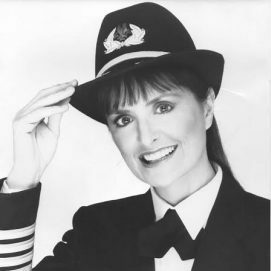 I began my airline career with American Airlines in March of 1973. Until my retirement in August of 1998 I was flying as a senior Captain on the Boeing 757 and Boeing 767 aircraft. In addition to flying the domestic Trans-Continental routes, I flew American’s international routes to the Caribbean Islands, South America and Europe. Prior flying duties as a Captain with American included flying the Boeing 727. As the workhorse of our fleet, the Boeing 727 provided a great opportunity to fly into most of the domestic cities that are served by American Airlines. In addition, I have flown as a Flight Engineer and First officer on the B-727 on both domestic and international routes. Created and produced three “Women of Accomplishment” luncheons from 1981 to 1983 for the Wings Club, Inc. in New York City. These events honored woman from various fields of endeavor. Some of the recipients included award winning actress Polly Bergen, race car driver Janet Guthrie, anchor woman Jane Paulie, feminist and author Betty Friedan, Rabbi Sally Priesand, actress and spokesperson Maureen O’Hara Blair, Moya Lear of Lear Aircraft Company, Television Workshop’s Faith Steward Gordon and opera singer Anna Moffo. Created the “Information Bank” – a networking system for the International Society of Women Airline pilots to help further their flying careers and the careers of women pilots just starting out. Guest speaker at many schools, colleges and private clubs including the Federal Aviation Association and the Ninety Nines, the oldest aviation organization for women aviators. The club’s first president was Amelia Earhart. 1984 – Wrote an autobiography, “Takeoff” published by Crown Publishing Co. Featured or appeared in Working Woman, Cosmopolitan, Harper’s Bazaar, Glamour, Reader’s Digest, Gold Coast Pictorial, Good Housekeeping, Women’s Wear Daily, Vogue, Woman’s Day and Smithsonian Magazine. Appeared in books by Henry Holden, Captain Robert Buck, John M. Capozzi, Lisa Yount and Carole S. Briggs – list incomplete. 1979 – Recognized as a “Super Sister” and placed on a Super Sister Trading Card. These trading cards were distributed to school age children nationwide. 1998 – Recipient of the “Women Making History Award” from the National Museum of Women’s History in Washington, D.C.
2016 – Key Note Speaker for the New York Bar Association’s Aviation Division. My American Airlines uniform is on display at the Smithsonian Air&Space Museum in Washington, D.C.
My husband and I live in New York City and have two grown children.